The first Major of the season is finally here! The LPGA Kraft Nabisco kicks off this Thursday March 31st and since this is a major for the LPGA we couldn’t think of a better company to partner with for a contest than Golf4her.com. They specializes is all things ladies golf and they even have some men’s gear too. Since this is the first major we are going to make this contest fun and easy so everyone can enjoy it. Reward points from Golf4her.com equivalent to $200! 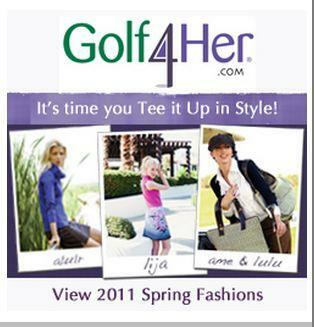 You can see all the incredible gear they offer at their website www.golf4her.com. The deadline of this contest Wednesday March 30th, 2011 at 11:59pm EST. This is open to everyone. However, if you are not a forum member, it is never too late to signup. 1. You will pick 3 players to be a part of your team of golfers from the field below. 2. The team with the most prize money at the end will be declared the winner. 3. You will also pick the winners total score (example: 270) for a tie breaker. Good luck to everybody and we hope that every person here has a blast with this contest following the ladies at the Kraft Nabisco. We want to thank Golf4her.com for an amazing prize. Thanks to Golf4her.com and THP for a great prize! It’s great to see the LPGA get some contest love too! Thanks Team THP and Golf4Her!! Great contest. Golf4Her has some very nice clothing and accessories. Thanks THP and Golf4Her. Awesome contest! My wife would love some golf clothes from Golf4Her. Thanks!